Keynes Cottage in Somerford Keynes, near Cirencester, Gloucestershire sleeps 6 people. Keynes Cottage near Cirencester is set on a corner plot; Keynes Cottage enjoys a peacfull position on Lower Mill Estate, a stunning nature reserve comprising hundreds of acres of countryside and lakes. French doors lead from the living/dining room on to a south-facing decked area, and a small bridge leads over the small stream on to the Mill Village green. The bedrooms are situated on the first floor and comprise a master bedroom with an en-suite bathroom, a twin bedroom and a bunk bedroom, making this especially good for families; there is also a family shower room. This is a perfect country retreat, and guests can benefit from a plethora of on-site facilities. You can enjoy eating at the restaurant/bar and a general store is handy for provisions when rustling up your own evening meal. To keep the whole family amused, the many activities available on-site include two hard tennis courts, canoe hire, bike hire, children’s play areas and football nets. You can also follow the nature trails around the water park and take in the abundance of wildlife, or take a dip in either the indoor or outdoor swimming pools. There is even an eco-pool filtered by lilies! Or why not work out at the gym, enjoy the steam room or sauna or pamper yourself at the ArtSpa, where treatments are available by arrangement (at cost)? Venturing out, the wonderful countryside of the Cotswolds awaits exploration, and places of interest in the surrounding area include Cheltenham, Bath and Oxford. This makes Lower Mill Estate an ideal base for touring. The shop, pub and restaurant are all on-site at Keynes Cottage near Cirencester. 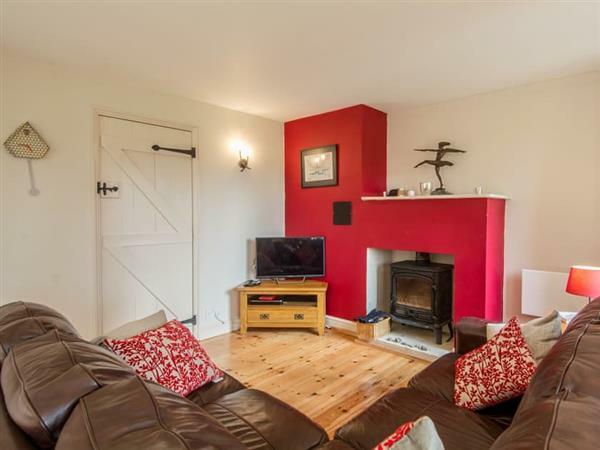 Living/dining room: With wood burner, Freeview TV and French doors leading to decked area. Kitchen: With electric cooker, microwave, fridge, dishwasher and washing machine. Bedroom 3: With 2ft 6in bunk bed and sloping ceiling. Electric central heating, electricity, bed linen, towels and Wi-Fi included. Initial logs for wood burner included. Travel cot, highchair and stairgate available on request. Welcome pack. Decked area with garden furniture. Spa with gym, indoor swimming pool, outdoor swimming pool, steam room and sauna (shared with other properties on-site). Tennis court (shared with other properties on-site). Private parking for 1 car; additional on-site parking. No smoking. Please note: There is brook beyond the decked area. Holidays at Keynes Cottage run from Friday to Friday. For a better idea of where Keynes Cottage is, you can see Keynes Cottage on the map below. Keynes Cottage is in Gloucestershire; should you be on the lookout for a special offer, you can find all the special offers in Gloucestershire. It's always worth checking to see what is on offer at the moment. Do you want to holiday near Keynes Cottage (UKC3933), you can see other cottages within 25 miles of Keynes Cottage; have a look to find your perfect holiday location.